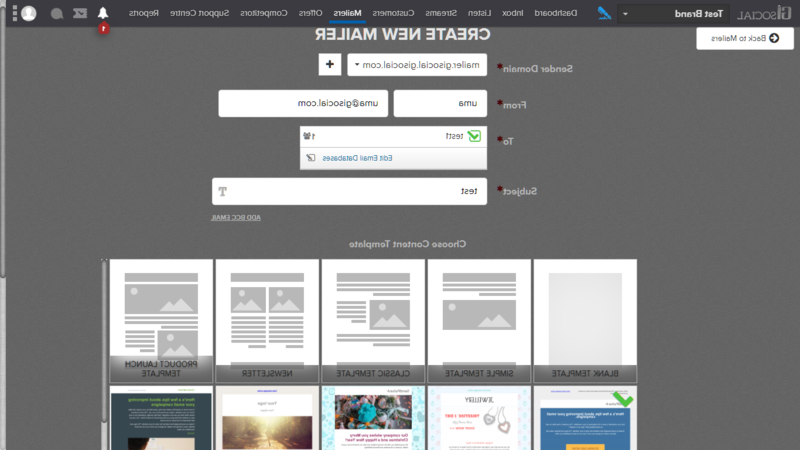 GI Social is a powerful tool with a good functionality. It is the tools of this platform that make it so special. From engagement to analytics, from monitoring to collaboration, GI Social has every feature you require for a social media management tool. GI Social allows its customers to promote their brand through social media channels, generate quality leads, and increase social traffic to their websites, all within one platform. GI Social allows you to share posts on various social media websites. An extremely user-friendly interface, powerful integrations, and highly capable features make it an excellent tool for small businesses and individuals’ alike. GI Social offers a suite of capable features aimed primarily at Multi-Brand management. One of the big features that separate GI Social from the rest is the ability to integrate multiple social networks into one single platform. Some top features of this platform are its ability to post to and connect with social networks at once, schedule updates, and engage with your followers. It supports publishing to Facebook, Twitter, Google Plus, Email, YouTube, and LinkedIn. You can also use GI Social for your email marketing campaigns by using one of their preset email templates or design your own. Then, you can personalize and schedule emails to best fit your needs. GI Social not only helps you draft, schedule and post messages in the social realm, but it also allows you to assign and manage tasks among team members and track and measure your social performance. It provides Real-time collaboration for better community management and higher engagement. You can create teams, assign tasks and set permissions across teams. It is a good Listening platform – Track what people are saying about your brand, product or competitor. It provides good overview analytics of social media and the web through integration with Google Analytics – In-depth analysis with customized and exportable reports. GI Social`s pricing model includes a free plan for individual users and small businesses, at Rs.5 /day as well as several paid plans. It also has custom pricing on an unlimited access plan for enterprise companies unlocking more functionality. In any case, you first sign up for the free account and select your features suited for your business requirements. E-Mail marketing is a crucial part of the vast majority of marketing strategies. E-Mail marketing automation is a powerful way to automate each and every e-mail from your bulk email database to be sent at a specific time depending on pre-defined triggers. One of the valuable benefits of E-Mail marketing automation is to communicate with individual customer at the most crucial point along his/her lifecycle in an automated fashion. By setting up your email campaign once and start sending different emails to different customers on/after/before the specific date or time like birthdays, anniversaries, expiry dates, etc. E-Mail Marketing automation is a useful tool to quickly and effectively allow your business to do email management effectively and discreetly. Statistics say that automated email messages lead to an average 70.5% of higher open rates and 152% higher click-through rates than usual emails. Why use Email Marketing Automation? E-Mail Marketing automation makes it possible for companies to connect with each of their customers in a highly personalized way that is difficult to do manually. They don’t have to manually send a welcome email every time a customer signs up for a newsletter or creates an account. Automation can help streamline their communication for repeat engagement like sending a birthday message once a year. A simple automated messages like `Thank you` or ` Welcome` may make customers feel warm and touched. This appreciated gesture helps to create a positive view of your company or brand. Reports say that marketing emails with personalized subject line have a 26% higher open rate as you are more likely to pay attention if someone addresses you personally. E-Mails with personalized content can have a transaction rate that is six times higher than those with generic messages. E-Mail marketing software allows you to create segments of your customers or lead database into different groups based on their interest and purchasing behaviour. With marketing automation platforms, you can reach out to them with content that interests them and by sending more relevant messages. This ensures that they only receive content that aligns with their interests. Segmenting your email list through a marketing automation platform can result in greater engagement. Market research study says that marketers who segmented their campaigns saw higher open rates and higher click-through rates. The most common use of email marketing is drip campaign. Drip campaigns are a great way to keep your business on top of the mind with those interested in your products and services but not ready to make a purchase. It consists of a series of automated emails that are sent to leads in a consistent manner for a set period. Drip campaigns have a higher open rate by 80% and greater click-through rate by 300% than single send campaigns. In today`s marketing world, savvy marketers often use a strong email strategy that encourages customers to make a purchase. Proper email marketing can help you accomplish your marketing goals thereby increasing sales. It has become a norm in today`s marketing scenario, to include recommendation emails that state “others also viewed”, “others also bought” that tend to give examples of services and provide additional information leading to conversion. Consumers purchasing behaviour and data can be analyzed through the power of marketing automation and while simultaneously sending emails tailored specifically to an individual consumer`s buying preferences and browser history helps to drive conversions. Schedule your E-Mails to send later. You can use GI Social`s `Schedule Mailer` feature to set up schedules for your E-Mail and send it at a chosen time later. Having a timeline can be helpful while sending campaigns. You have the option to select a date and time for delivery when creating a campaign using GI Social. However, your E-Mail Marketing schedule will vary depending upon the industry and types of content you send and also your sending frequency. E Mail Marketing remains as one of the most effective channels of marketing for your business today. You can now personalize your marketing efforts with our powerful tool. It helps to build and strengthen your relationships with your potential and existing customers. GI Social is a marketing platform that helps you send E Mail campaigns to your clients and audience. 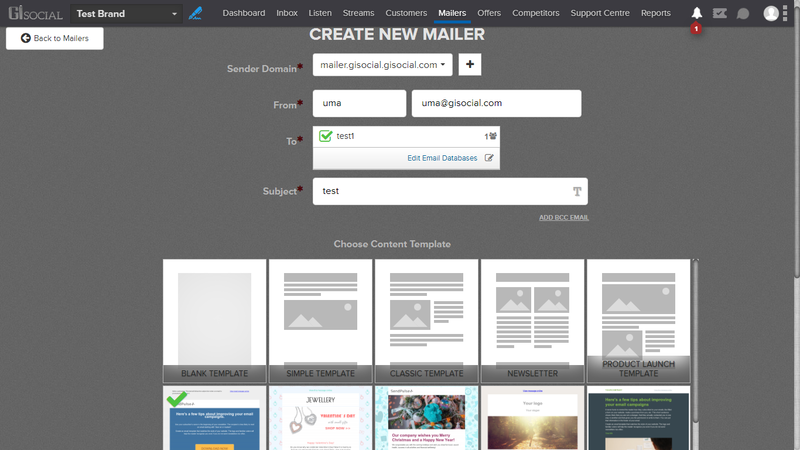 GI Social makes it easy to design beautiful personalized E Mail Campaigns and send great looking E Mails. You have an option of using E Mail to reach a large number of customers by sending bulk emails. After sending an E Mail campaign, you will be able to track the performance of the campaign with our GI Social Reports. Access Menu Tab and click “Mailer”. A Mailer Page opens up. Click “Create Mailer” button on the left top corner. A new page opens up, where you need to fill Mailer details such as “Sender Domain”, “From”, “To”, “Subject” & choose the Mailer template. In “To” address, you need to select the Email list to send Mailer. 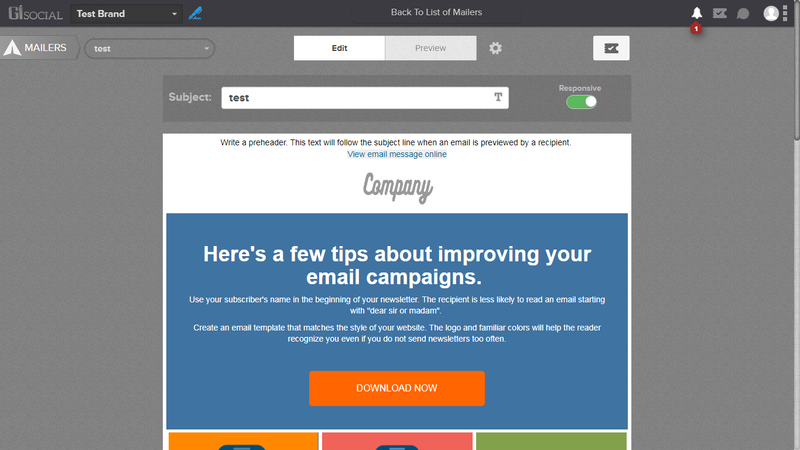 Once you have filled the above details, then click “Create Mailer Campaign” button to launch the Mailer. Then Mailer Campaign Page opens up as seen in the image below. Fill your Mailer details in the chosen template. Once you finish your Mailer, you can preview it. To Preview: In the same page, you can see the Preview button on top of the page. This helps to preview the designed email. In case you want to make changes in the Mailer, go to Mailer Settings. In the same page, you can see the Settings Icon next to the Preview button on top of the page. Click it. Mailer Campaign Settings page opens up. Here you can change all that you want to. Also, you have a delete option to delete the campaign itself. In order to avoid sending E-Mails with missing data or broken links, make sure to test your E-Mail content. It is considered a good practice to send a few test E-Mails to yourself to ensure everything works well and looks the way you want. Once you’ve done with the body of the Mailer and tested it with our tools, click “Send Mailer” button to send the Mailer.